This article is adapted from a Gamasutra article written by Nicholas Laborde. My name is Nicholas Laborde, and I am a raconteur. I’ve always enjoyed telling stories — it’s what inspired me to be a journalist for three years, before focusing on starting my indie company, Raconteur Games. There truly is nothing like a well-told story, and today, I’d like a few minutes of your time to discuss something I’ve come across in the indie scene: a negative perception of business and businesspeople. It all started out my junior year of high school, where I began thinking about my senior project. Part of the project required having a mentor within the field you were studying in order to guide you along the way and overall help set you up for success. I dreamed big: I wrote a snail mail letter to Randy Pitchford, the President of Gearbox Software, and asked him to be my mentor. He emailed me about a week later politely declining as he said he did not want to be a bottleneck for my efforts due to him being so busy; he said he was “inspired by my passion” and wished me well, which was surreal. I tried, right? Five minutes later, I get an email from Aaron Thibault, VP of Product Development at Gearbox, and he was offering to be my mentor. For three days over the course of the next school year, my life was changed and my career path was solidified thanks to Aaron’s kindness and guidance: I knew I wanted to lead a game team. He and other kind folks at Gearbox showed me all walks of the game development life: HR, legal, art, level design, sound design, coding… everything. It was surreal and incredible, and to say it altered the course of my life would be an understatement. Fast forward a few years, and I’m leading an indie team known as Raconteur Games down in Lafayette, Louisiana. The greater Lafayette region, known as Acadiana, is undergoing a tech boom right now. Take my word for it — give it around five years, and Lafayette will be the tech hub of the American South! In my time here, I’ve met some utterly fantastic businesspeople who have been nothing but kind and helpful to me (the general culture of Louisiana, I find), and one of them is essentially my second mentor, Zachary Barker. He’s the Executive Director of the Opportunity Machine, a startup accelerator. Zach has come up with something that I like to call the Barker Entrepreneurial Triangle (a clever acronym for “bet”), and it’s key to understanding the point of this blog post. It wasn’t until I met Zachary that I knew where I stood in the grand scheme of things — I’m a Deal Maker. Let’s explain the three points briefly! Deal Makers are your people with business acumen who see the picture that no one else can, and wants to solve the problem in a way that no one else has before. The Deal Maker finds the right people to execute the vision, and usually is not the one doing the specific work to bring it to life (but can certainly be doing it). Technicians are your highly skilled people, but don’t confuse it specifically with the tech industry. A lawyer is a technician of the law, an accountant is a technician of bookkeeping, etc. Technicians build the Deal Maker’s vision and make it come to life. Finally, Administrative focuses on everything in-between that’s essential to keeping things running — office managers, anything related to operations, etc. The goal of the Entrepreneurial Triangle is to move you inward toward the well-balanced CEO position, no matter what point of the triangle you are on. In the indie scene, I see something alarming: I see way too many Technicians and not nearly enough Deal Makers. The few Deal Makers I see don’t want to put in the work to learning the multidisciplinary nature of leading a game team, or they give up when it gets too tough. I’m going to use the brilliant HBO show Silicon Valley as an example. In an episode, the team is at a startup competition, and a small segment of the episode focuses on how everyone is using the same buzzwords (“unique,” “making the world a better place”). More importantly, it spends a moment focusing on a startup that developed portable microwave devices that were used to purportedly heat your body immediately. A bit of ego gets caught up and they think they don’t need business knowledge, and next thing you know the project flops. Let’s go with another common example: Games with overnight success on Greenlight or Kickstarter that reach their goals, and are never completed. The devs disappear without a trace, or never finish the game, or never release it. It went from something that Technicians could make awesome, but then when a Deal Maker should have been assisting (at the very least from the outside), it collapsed on itself. I was making reddit posts about my team’s project Close Order, which is currently on Steam Greenlight. In one, I made a comment about how I became very stressed out when we dropped off the front page of Greenlight, because if we don’t get Greenlit I can’t pay my bills. Apparently, because I’m an indie dev, this isn’t a “real” job or a “real” business. This negative perception of business in the indie scene applies on both the development and consumer end of things, unfortunately. But we can change this. I see the image to the right far too often, and we write it off as just “part of the industry.” It doesn’t have to be, because business is vital to your success! 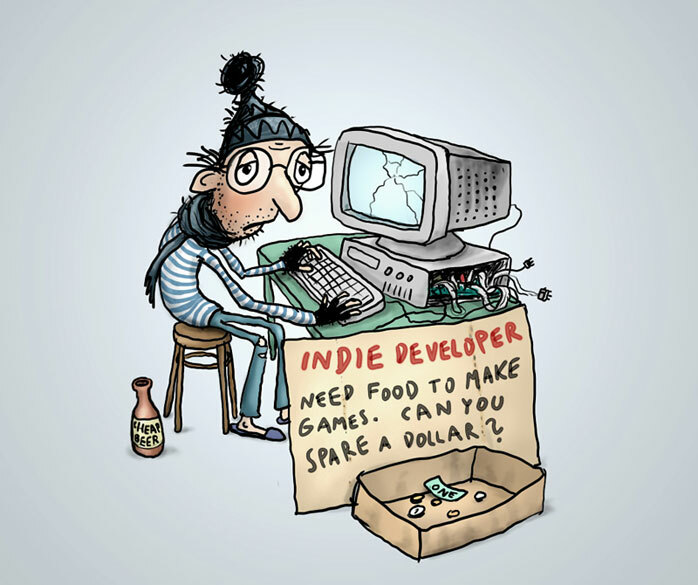 One of my missions is to come up with a way to educate indie devs about the business end of making a game. Any time I see a dev asking questions about business, I give as much advice as I can and then offer them to personally email me any time if they have questions. I also offer that same deal to you. I want to see people succeed — that’s what the Deal Maker does. They provide resources and set people up for success. If any readers in the industry have ideas about how this indie developer business outreach/education could be made possible, feel free to comment or reach out. And if you’re a Technician needing any sort of advice, I’m a Deal Maker who is more than willing to be of service to you. I was once told that I was too young to start a business, and that starting a business was the “worst” way to get in to this industry. Don’t fall in to that mindset. Build your own dream, because if not, someone else will hire you to build theirs. Success is defined by YOU, and you alone! Special thanks to Nicholas for authoring this article.